The Battery has 5 cannons available for it’s use, all muzzle-loading cannons. Three original cannons (two 12 pdr Napoleons, and one 20 pdr Parrott) that were fired in battle during the Civil War and two full scale reproduction pieces (a 10 pdr Parrott and a 1841 model 6 pdr). 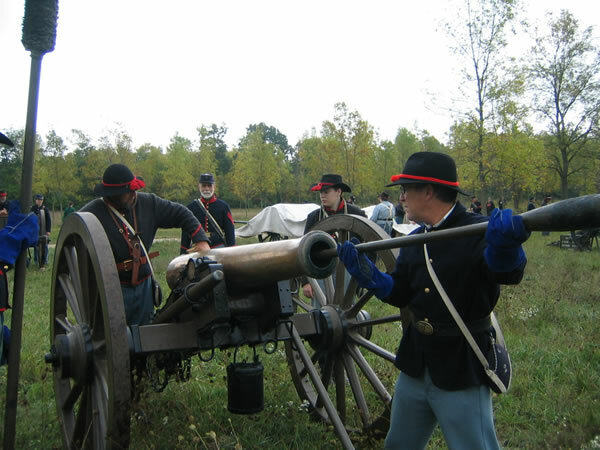 The cannon seen here is one of the 2 original 1857 model bronze 12 pounder Napoleons; both of which are smoothbores. 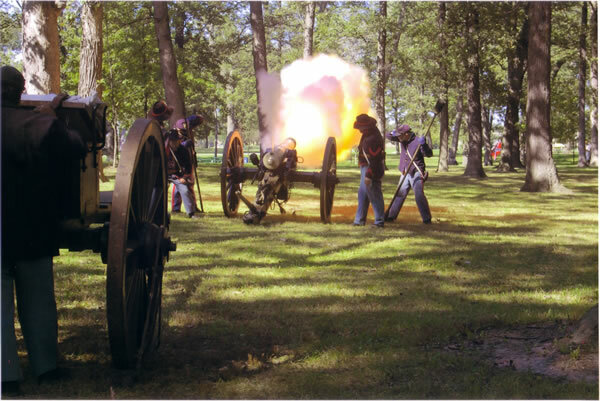 In this photo the gun crew is in the process of “clearing the piece”; extinguishing embers and removing debris from the barrel after the cannon has been fired. This photo shows one of the Napoleons just after it’s been fired at Zion in 2006. Both rifled and smoothbore guns fired the following projectiles: canister, case, shell and solid (for rifled guns, the solid projectile is called a “bolt” while for smoothbores it’s called “solid shot”). With the exception of canister, the smoothbores fired spherical projectiles and the rifles fired bullet-shaped elongated projectiles. The original 20 pdr Parrott rifle, shown here and which also can be seen on display at Swiss Historical Village in New Glarus, Wisconsin, would have been the largest field piece employed by the light artillery. This cannon was originally a naval gun that was on a gunboat (the U.S.S. Katahdin) that patrolled the Mississippi during the war. The distinguishing feature of the Parrotts is the band that’s melded onto the breech ; this band reinforces the area which would experience the greatest pressure and most likely to burst in the event of a failure. Click on the image to see the band a bit better. 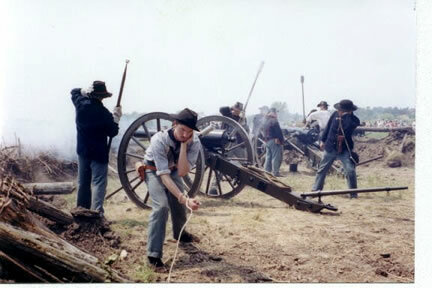 The 10 pdr Parrott,shown here at the 2002 Rockford reenactment, is a scaled down version of the 20 pdr and would fire a 10 pound projectile. All Parrott cannons were made of iron and were rifled. Rifling a cannon would enable it to fire a round further and with greater accuracy than a comparable smoothbore would. In addition to our cannons, the Battery has a forge that would have been used by farriers or an artificer. Farriers shoed horses while an artificer was a blacksmith. One of these forges accompanied every battery in the field, enabling the atificer and farriers to repair cannon carriages, make horseshoes and shoe horses and mules. 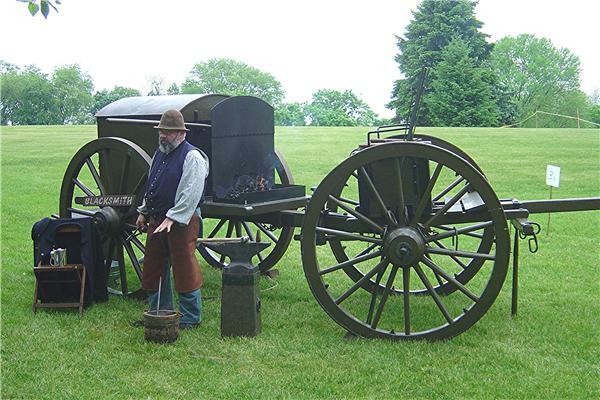 The forge you see here was made by our unit commander per 1849 U.S. Army specifications and plans.